It's nearly a year since the first Fantastic Beasts movie came out, and it's also exactly a year until the next installment is set to be released. To mark the occasion, Warner Bros. has release a whole load of Fantastic Beasts 2 goodness online, including a brand new cast photo, title and synopsis. Merlin’s beard! Hot on the heels of the teaser, we now know that Fantastic Beasts 2 is called Fantastic Beasts: The Crimes of Grindelwald. Intriguing stuff, eh? And then there’s that awesome cast photo to contend with. In pride of place is Eddie Redmayne as the series protagonist, magizoologist Newt Scamander. Accompanying him is his team from the first movie, consisting of MACUSA Auror Tina Goldstein (Katherine Waterston), her sister Queenie (Alison Sudol) and the No-Maj/Muggle, Jacob Kowalski (Dan Fogler). Interestingly, it seems that Jacob has got over that whole mind-wipe thing from the last movie. Curiouser still, this photo confirms that Ezra Miller is back as Credence Barebone after being blasted to smithereens in the previous film. Next to him is Avengers: Age of Ultron’s Claudia Kim as an unnamed character, whom the main crew will reportedly meet at a wizarding circus. Apparently, Kim will feature as a ‘Maledictus,’ which is someone that suffers from a blood curse that turns them into a beast. We've never heard of those before, but they already sound cool. As for those other people in the center of the photo? Well, that’s Newt's brother, the Auror and war hero Theseus Scamander (Callum Turner), who was briefly mentioned in the first movie. On his arm is one Leta Lestrange (Zoë Kravitz) who, according to the official press release, is Theseus's fiancée. Newt was hurting throughout the first film because of his troubled relationship with Leta, his lost love. The fact that she's engaged to his brother must definitely factor into that. The most notable thing on show here are the two dapper chaps at opposite ends of the picture. On the right side is Johnny Depp as the incorrigible villain, Gellert Grindelwald, who appears in a new and rather swashbuckling outfit. And most excitingly of all, we have our first look at Jude Law as a young Albus Dumbledore before his silver-haired days as Hogwarts' Headmaster. You can see Dumbledore on the lefthand side. Doesn’t he look classy with that big coat and beard? “At the end of the first film, the powerful Dark wizard Gellert Grindelwald (Depp) was captured by MACUSA (Magical Congress of the United States of America), with the help of Newt Scamander (Redmayne). But, making good on his threat, Grindelwald escaped custody and has set about gathering followers, most unsuspecting of his true agenda: to raise pure-blood wizards up to rule over all non-magical beings. Oh my word! What could all of this mean? Let’s take a look. What Are The Crimes Of Grindelwald? As a title, Fantastic Beasts: The Crimes of Grindelwald is really indicative of where the series is going. We’ve already heard tell that the Harry Potter prequel saga is heading towards that climatic duel between Albus Dumbledore and Gellert Grindelwald in 1945. Newt Scamander and his friends are clearly playing a large part in the proceedings, yet the fact that ol’ Gellert is in the title of this movie does suggest that the next film is leaning into that Dumbledore vs. Grindelwald story line very heavily indeed. So is the new Fantastic Beasts set to explore something from Grindelwald’s early days? It’s possible, but it’s more likely that The Crimes of Grindelwald will be looking at his more recent exploits, particularly those in America and beyond. In the guise of Percival Graves (Colin Farrell), Grindelwald groomed Credence Barebone to locate the dark and powerful entity known as the Obscurial. Since Credence — the creature’s host — is returning from his presumed death, we’d bet that Grindelwald will reattempt to harness that destructive power once again. This would also explain why Dumbledore would want to recruit Newt, since our protagonist is already an expert on Obscurials. Yet in these discussions of magical power, we’ve got to consider those fabled Deathly Hallows. 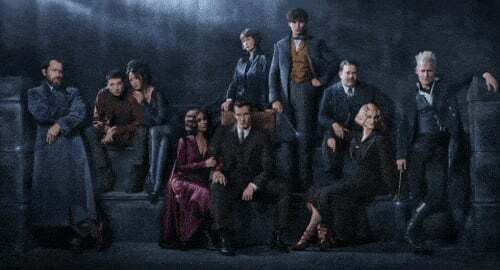 Tellingly, the Elder Wand — which was notably absent in the first Fantastic Beasts film — can be seen in Grindelwald’s hand in the new cast picture, and Dumbledore is on point sporting his original and previously unseen wand. As Harry Potter fans will know, Grindelwald and Dumbledore searched for the Elder Wand and its fellow Hallows in their youth before they parted ways. Moreover, Grindelwald stole the Elder Wand from the wand maker Gregorovitch and used it to deadly effect in his reign of terror, until Dumbledore seized it from him in their climatic duel. So, is Dumbledore recruiting Newt to stop Grindelwald from getting his mitts on those other formidable objects? Or is something else going on? Why is the creator of the Sorcerer’s Stone — Nicholas Flamel — confirmed to be appearing in the film? Does he have information on Obscurials, the Deathly Hallows, or something else that Grindelwald wants? So many questions present themselves, but alas, at this early stage we simply cannot answer them. Fantastic Beasts: The Crimes of Grindelwald hits theaters November 16, 2018. Billy Bob Thornton Is Sporting A Raging Broner For My Little Pony! White House Down: The Worst Fictional Presidents From Film And TV!